AMPHITHEATER. As we look northwest, the curving wall of the polar cap embraces a dark sheet of frozen sand emerging from under the ice. Editor's Note: This article was originally presented by the Mars Odyssey's Thermal Emission Imaging System (THEMIS) team at Arizona State University. It is reproduced here with permission. Both martian polar caps show ragged outlines, with sinuous valleys and spiral-shaped troughs giving the caps' edges a sawtooth outline. Scientists think the spirals develop as solar heating melts and evaporates the ice more strongly on the equator-ward and west-facing sides of any slight depression. In time, these deepen into valleys and canyons. The largest trough in the northern polar cap is a huge canyon named Chasma Boreale. It runs into the ice cap for 570 kilometers (350 miles), making a broad valley that ends at a point called Tenuis Cavus, shown in this THEMIS image taken at visible wavelengths. Tapering from a width of 120 km (75 miles) at its mouth, Chasma Boreale is only about 35 km (22 miles) wide here. The cliffs on the northern (top) and eastern (right) sides of the image rise about 1,400 meters (4,600 feet) above the base. On the inside walls of this gigantic amphitheater are stacked layers of ice, while on its floor lie a dark sheet of what is likely frozen sand and a horde of sand dunes marching down-canyon under the winds' direction. 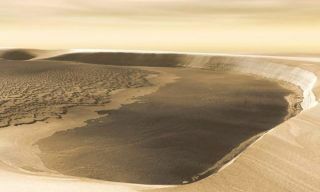 Chasma Boreale is so dramatic a feature that it forms part of a proposed martian "Polar Park." Yet setting aside future tourist revenues, the canyon is rewarding scientists today with glimpses into the history of the martian climate. The tilt of Mars' axis, and the season when it is closest to the Sun, both vary on timescales of hundreds of thousands of years. These ensure that the polar regions undergo big changes. For example, at times of high obliquity (large tilt), the martian tropics become colder than the poles, and polar ice migrates toward the equator. Scientists studying layers in the ice cap are using statistics to identify patterns that represent climatic shifts. These generally correlate with computer simulations that calculate the tilt of the martian axis and changes in its orbit for a million years or more in the past. Beneath the polar cap lies a sheet of what some scientists think is frozen sand. As they reconstruct it, the sand collected in the northern lowlands as winds drove erosion debris from elsewhere on Mars into the broad topographic low centered on the pole. This depression lies 5 km (3 miles) below the average planetary radius. If water ever collected in the lowland, it would have saturated the sand sheet. One clue lies in the impact craters the sand layer contains (seen in the small image). These show the same splashy debris patterns as do craters elsewhere on Mars that formed where the ground was saturated. Then, at some point, the martian climate shifted, and polar caps began to grow. In the north, the accumulating ice buried the sand sheet, preserving intact its craters, ridges, and low hills. Now, as Mars' climate pendulum swings yet again, this long buried, relic landscape is emerging into view once more from under the ice cap. Surrounding the polar cap and extending out from it in places for more than 600 km (370 miles) is a vast sand sea of dunes. Scientists call this the northern polar erg, using the Arabic term for a sandy desert. The dunes, scientists say, begin to form as the frozen sand sheet buried under the cap finally warmed enough for ice to melt and set the sand grains free. Driven by cold winds blowing off the ice, the dunes spread down the valleys and canyons and out onto the polar lowland, moving away from the cap. This article was originally presented by the Mars Odyssey's Thermal Emission Imaging System (THEMIS) team at Arizona State University. It is reproduced here with permission. More images and information are available at the THEMIS Web site.